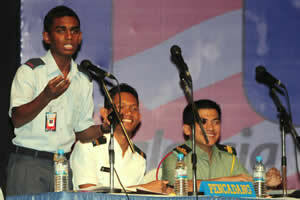 BANGI, 13 Dec. 2010 –Debating as an intellectual exercise in the learning and teaching process should be made part of the curriculum in all public institutions of higher learning in the country. Deputy Minister of Higher Education, Datuk Saifudin Abdullah who made the suggestion today said through debates, undergraduates will be encouraged to question and argue during lectures. 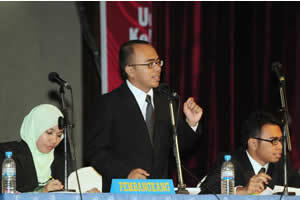 Speaking at the finals of the 1Malaysia Debate 2010 between Institutions of Higher Learning, organised by the Ministry in collaboration with Universiti Kebangsaan Malaysia (UKM) and the Malaysian Universities Debating Council (MADUM), here today, he hoped the measure could overcome claims that local graduates were passive and less critical at work, a major complaint from employers. He said there was the perception that local graduates were passive compared to graduates from overseas because the process of Teaching and Learning there were more interactive. 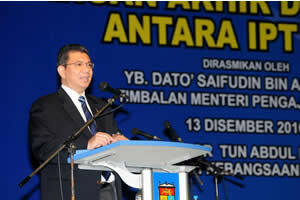 Saifudin said debate could also help overcome the problem of lack of intellectuals in the country today. As an incentive, the ministry had allocated RM365,000 this year for debating activities. Saifudin wants the council to provide a platform in the universities to form a special unit to manage debating and public speaking as the Universities Sports Council (MASUM) built Sports Centre and the Cultural’s Unit formed its Cultural Centre. “This is one of the ways we can upgrade the Learning Outcome of Skilled Human Capital among our graduates and improve their marketability. “With this special unit that overseas debate and public speaking activities in the universities, I believed the era of graduates leadership as in the seventies can be revived. “Speaker’s Corner that became the main arena for undergraduates to polish their talent can be implemented just as the lack of able leaders and the problem of weak communication skills can be overcome,” he said. UKM’s Vice Chancellor, Prof Tan Sri Dato’ Dr Sharifah Hapsah Syed Hasan Shahabudin in her speech said UKM has become the pioneer in reintroducing Speaker’s Corner as a platform for public speaking by students since January this year, after being banned for three decades in all institutions of higher learning in the country. “The Speaker’s Corner which was the most popular stage for undergraduates to voice their views in the 1960s and 1970s had given birth to many known figures that contributed to the nation in various fields. 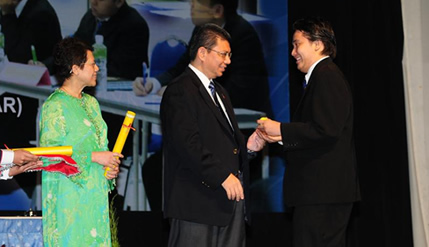 “Among them were former Director General of Education, Datuk Alimuddin Mohd Dom; President Mercy Malaysia, Datuk Dr Jemilah Mahmood; Minister of Health, Datuk Liow Tiong Lai and many other individuals who have carved their names in their own fields of expertise. “It is hoped that the reintroduction of the Speaker’s Corner will give birth to more intellectuals in the future,” she said. In the finals of the 1Malaysia Debate, debaters from UiTM emerged champions beating the team from Malaysian National Defence University (UPNM).